The domain within your query sequence starts at position 21 and ends at position 248; the E-value for the Arfaptin domain shown below is 1.54e-125. Arfaptin interacts with ARF1, a small GTPase involved in vesicle budding at the Golgi complex and immature secretory granules. The structure of arfaptin shows that upon binding to a small GTPase, arfaptin forms an elongated, crescent-shaped dimer of three-helix coiled-coils. The N-terminal region of ICA69 is similar to arfaptin. 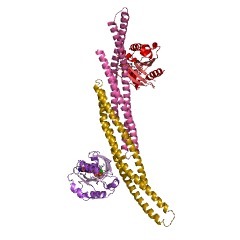 The arfaptin homology (AH) domain is a protein domain found in a range of proteins, including arfaptins, protein kinase C-binding protein PICK1 [(PUBMED:10623590)] and mammalian 69 kDa islet cell autoantigen (ICA69) [(PUBMED:12682071)]. The AH domain of arfaptin has been shown to dimerise and to bind Arf and Rho family GTPases [(PUBMED:11346801), (PUBMED:11696355)], including ARF1, a small GTPase involved in vesicle budding at the Golgi complex and immature secretory granules. 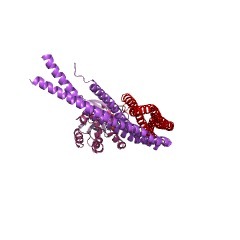 The AH domain consists of three alpha-helices arranged as an extended antiparallel alpha-helical bundle. Two arfaptin AH domains associate to form a highly elongated, crescent-shaped dimer [(PUBMED:11346801), (PUBMED:11696355)]. There are 3577 Arfaptin domains in 3576 proteins in SMART's nrdb database. Taxonomic distribution of proteins containing Arfaptin domain. This tree includes only several representative species. The complete taxonomic breakdown of all proteins with Arfaptin domain is also avaliable. Click on the protein counts, or double click on taxonomic names to display all proteins containing Arfaptin domain in the selected taxonomic class. Islet cell autoantigen of 69 kDa is an arfaptin-related protein associatedwith the Golgi complex of insulinoma INS-1 cells. 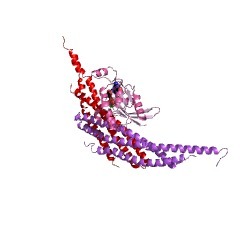 Islet cell autoantigen of 69 kDa (ICA69) is a cytosolic protein of stillunknown function. Involvement of ICA69 in neurosecretion has beensuggested by the impairment of acetylcholine release at neuromuscularjunctions upon mutation of its homologue gene ric-19 in C. elegans. Inthis study, we have further investigated the localization of ICA69 inneurons and insulinoma INS-1 cells. ICA69 was enriched in the perinuclearregion, whereas it did not co-localize with markers of synapticvesicles/synaptic-like microvesicles. Confocal microscopy and subcellularfractionation in INS-1 cells showed co-localization of ICA69 with markersof the Golgi complex and, to a minor extent, with immatureinsulin-containing secretory granules. The association of ICA69 with theseorganelles was confirmed by immunoelectron microscopy. Virtually no ICA69immunogold labeling was observed on secretory granules near the plasmamembrane, suggesting that ICA69 dissociates from secretory granulemembranes during their maturation. In silico sequence and structuralanalyses revealed that the N-terminal region of ICA69 is similar to theregion of arfaptins that interacts with ARF1, a small GTPase involved invesicle budding at the Golgi complex and immature secretory granules.ICA69 is therefore a novel arfaptin-related protein that is likely to playa role in membrane trafficking at the Golgi complex and immature secretorygranules in neurosecretory cells. The structural basis of Arfaptin-mediated cross-talk between Rac and Arfsignalling pathways. Small G proteins are GTP-dependent molecular switches that regulatenumerous cellular functions. They can be classified into homologoussubfamilies that are broadly associated with specific biologicalprocesses. Cross-talk between small G-protein families has an importantrole in signalling, but the mechanism by which it occurs is poorlyunderstood. The coordinated action of Arf and Rho family GTPases isrequired to regulate many cellular processes including lipid signalling,cell motility and Golgi function. Arfaptin is a ubiquitously expressedprotein implicated in mediating cross-talk between Rac (a member of theRho family) and Arf small GTPases. Here we show that Arfaptin bindsspecifically to GTP-bound Arf1 and Arf6, but binds to Rac.GTP and Rac.GDPwith similar affinities. 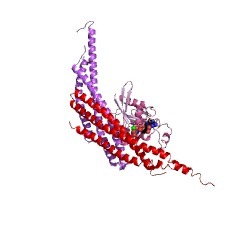 The X-ray structure of Arfaptin reveals anelongated, crescent-shaped dimer of three-helix coiled-coils. Structuresof Arfaptin with Rac bound to either GDP or the slowly hydrolysableanalogue GMPPNP show that the switch regions adopt similar conformationsin both complexes. Our data highlight fundamental differences between themolecular mechanisms of Rho and Ras family signalling, and suggest a modelof Arfaptin-mediated synergy between the Arf and Rho family signallingpathways.